NDF2 is a dehydrated foundation mix developed by Wendy Volhard which allows you to add your own protein to provide your dog with a fresh, healthy and balanced diet. NDF2 is crafted in small batches with whole food ingredients and herbs to support the liver, kidney, heart, lungs, stomach and digestive tract. Each ingredient is tested when it enters the facility for E. Coli, fungus and mold. After every batch is prepared, the batch is assay tested again 3 times to make sure there is no E. Coli, fungi, and mold. 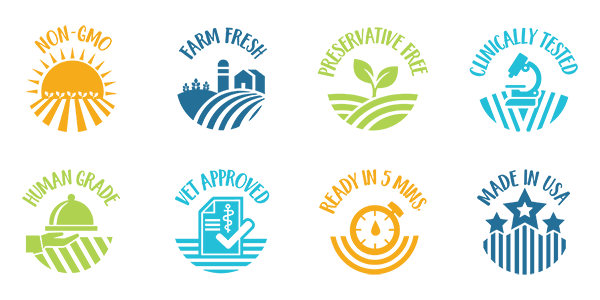 Volhard takes every precaution to make sure the product you receive is a safe and nutritious product! During the cold dehydration process, only moisture is extracted so that the integrity of the vitamins, minerals and amino acids is maintained, which revitalize when hydrated with water. Herbs have been added to support the liver, kidneys, heart, stomach and the digestive tract of the dog. NDF2 is suitable for dogs with a history of digestive upsets and is used by breeders, trainers and pet owners who wish to have long-lived, healthy dogs. 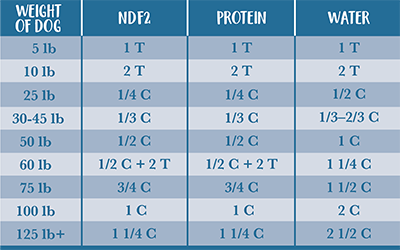 NDF2 contains only natural preservatives. Refrigerate or freeze upon receipt. The Natural Diet recipe has been clinically tested on different breeds, sizes, and ages of dogs (bloodwork and urine) for over 30 years and has improved the health, vitality, and longevity of dogs. The Volhard Dog Nutrition Natural Diet Foundation 2 (NDF2) was formulated to exceed the nutritional levels established by the NRC and AAFCO Dog Food Nutrient Profiles for All Life Stages, including the growth of large size dogs. This dehydrated diet is for the family that needs the convenience of easy feeding but wants to feed a fresh, healthy, balanced diet. The meat and water you add will be the heaviest ingredients, followed by: Oats, Wheat Bran,Chicken Liver, Wheat Germ, Calcium Phosphate, Calcium Carbonate, Brewers Yeast, Dried Apples, Carrots, Molasses, Eggs, Buckwheat Groats, Safflower Oil, (Omega 6), Cod Liver Oil(Omega 3), Apple Cider Vinegar, Parsley, Kelp, Alfalfa, Burdock Root, Dandelion Root, Rosemary, Garlic, Ginger, Yucca, Diatomaceous Earth, Vitamin C (Calc. Ascorbate), Vitamin E, Natural Mix Tocopherols (Vitamin E), Montmorillonite. Fermented Probiotics: Lactobacillus acidophilus, Bacillus Subtilis, Bifidobactrium, Bifidobacterium longum, Enterococcus faecalis, Schidigera, Chelated Zinc, Manganese, Iron, Copper and Cobalt, Vitamin B Complex consisting of - Choline Chloride, Niacin, Riboflavin, d Calcium Pantothenate, Thiamin, Pyridoxine, Biotin, Vitamin A and D 3, Selenium. NDF 2 does NOT contain corn, rye, gluten meal, soy, spinach, celery, bell peppers, tomatoes, artificial preservatives, artificial coloring, trans fats or genetically modified products. 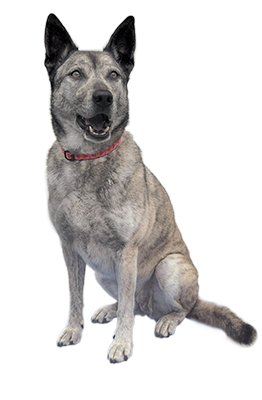 Each dog is an individual with different lifestyles and metabolisms. The following are only guidelines. Before putting your dog on NDF2, weigh him or her. 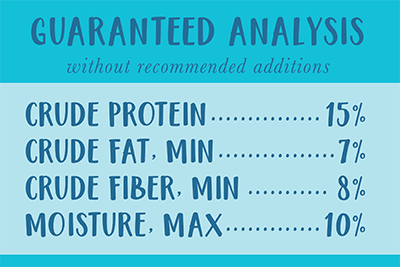 The amounts listed are for dogs that get about 2 hours of exercise a day. If your dog starts to put on weight, cut back on the breakfast meal, feed the new amount for a week, then re-weigh him or her. Adjust accordingly. 1. Put NDF2 into a dog bowl. Feed equal amount twice a day. If you are already feeding a raw diet, you can make the transition immediately. To prevent digestive upsets when changing from a kibble diet, transition your dog over a period of about 7 days. Add a small amount of NDF2 and meat to the kibble you are feeding your dog now and mix with water. As the week progresses, gradually increase the amount of NDF2, meat, and water, at the same decreasing the kibble by a corresponding amount, until you have phased out the kibble. (If you are feeding the same meat protein for six days, you may want to feed another protein - canned mackerel or cottage cheese - on the seventh day.) At the end of the transition period, weigh your dog. Weigh him again after four weeks. Increase or decrease the amount you feed accordingly. NDF2 is a dehydrated product. A 5-lb bag of NDF2 has 16 1-cup servings in the bag and will feed a 30lb. dog (according to the instructions on the bag) for 30 days. Puppies 7 weeks through teething are fed four times a day an amount that is double their weight. For example, if you have a 12-lb puppy, use the guidelines for a 25-lb dog. Divide into four meals. Feed one meal at 8 a.m., one at noon, one at 4 p.m. and the last at 8 p.m. When the puppy is through teething, reduce feeding to three times a day and decrease the amount slightly. 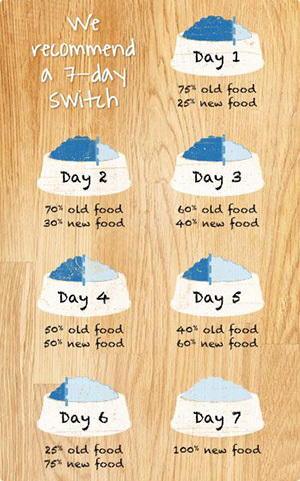 Gradually increase the amount you feed as your puppy grows. Dogs go through growth spurts up until 2 years of age and you may have to increase the amount fed for a short period of time. Around 6 to 7 months, reduce to two feedings following the guidelines for the weight of your dog. Both my dogs love the mix with the meat, can’t wait to start seeing the benefits of switching to raw with them! I am in love with this food. Not only is it awesome for my dog?,my dogs love it to. I no longer have to play a guessing game on what food is good for them only to toss it away. I have not wasted a even a small amount. They actually dance for their food and go directly to there crate to be fed. They lick their bowls clean. They are happier and healthier. I will never buy store bought junk anymore. This food is worth every dime. My granddaughter adopted a special needs dog a couple of years ago. Duke has epilepsy. She has had him on the NDF2 diet for most of that time. During that time she has tried to switch to a kibble diet 2 times. The first time, he started having seizures regularly so, she put him back on the NDF2. She wasn't quite sure if it was because of the quality of the kibble that caused him to have more seizures or just not having the NDF2. About 3 months ago she tried to switch him again, but this time made sure the kibble was high quality. During this transition time, for the first time, I witnessed him having 3 seizures. It was very upsetting for me, very scary, and just plain awful to see this poor guy go through this. I immediately ordered more NDF2. Since getting back on the NDF2, he has not had any seizures. It is really amazing and evident how diet affects Duke. He will definitely be on NDF2 for life! A trainer who was working with our 2 English Springer Spaniels on behavioral issues recommended that we transition to NDF2. She started the process and we are continuing. We expect that their skin issues will disappear as well as issues with their ears. We already notice a big difference in their stools. They have initially lost some weight but appear to be healthier. We'll know more as we get further in the process. They love it and devour it. The girl was a picky eater but no more. We just cracked open our second bag and our three furry boys LOVE it! More energy than ever and their coats look awesome!! Absolutely love this dog food. My dogs get so excited when it's time to eat. Their coats are so shiny and soft. We have been feeding our 11 year old Portuguese Water Dog NDF2 since we got him at 8 weeks. He is a strong healthy (knock on wood) senior dog with a stable weight lots of energy and a good digestive system. Update: My 5 month old boxer puppy loves her NDF so much! She devours her meals in seconds. Since my 1 year old Boxer has been eating the NDF, our puppy had no problems with the raw and NDF. Huge improvement to their system, coat is shiny, soft and both NEVER walk away from a feeding. Worth every penny Wendy! Thank you so much! We were introduced to NDF2 by Ann Greene about 6 mos ago. Our 2yo Golden and 5yo Lhasapoo LOVE it. Breakfast and dinner time is so exciting. I have noticed a huge decrease with how much our little guy scratches, and he hasn't had any hot spots. The product is expensive combined with adding protein (raw hamburg) and we are spending at least 3x as much but we spend more on less. They're health is worth every penny. I've had my dog on this product for just under a week. She loves the food and eats well. I'm excited to see where she is in a month. Im happy to feed her better food and keep her happy and healthy. My friend Jennifer Carter turned me on to this amazing product.